In this video, Dr. Huntoon discusses the 4 Causes of All Health Concerns and helps you to understand that having any symptoms are not normal. Click on the link below to listen to the radio show about the Stomach. When you are ready to address the cause of your Heartburn, we are here to serve you. Gastroesophageal Reflux Disease (GERD) is a more serious form of Gastroesophageal Reflux (GER), which is common. GER occurs when the lower esophageal sphincter (LES) opens spontaneously, for varying periods of time, or does not close properly and stomach contents rise up into the esophagus. GER is also called acid reflux or acid regurgitation, because digestive juices—called acids—rise up with the food. The esophagus is the tube that carries food from the mouth to the stomach. The LES is a ring of muscle at the bottom of the esophagus that acts like a valve between the esophagus and stomach. When acid reflux occurs, food or fluid can be tasted in the back of the mouth. When refluxed stomach acid touches the lining of the esophagus it may cause a burning sensation in the chest or throat called heartburn or acid indigestion. Occasional GER is common and does not necessarily mean one has GERD. Persistent reflux that occurs more than twice a week is considered GERD, and it can eventually lead to more serious health problems. People of all ages are susceptible to the condition. The main symptom of GERD in adults is frequent heartburn, also called acid indigestion—burning-type pain in the lower part of the mid-chest, behind the breast bone, and in the mid-abdomen. Most children under 12 years with GERD, and some adults, have GERD without heartburn. Instead, they may experience a dry cough, asthma symptoms, or trouble swallowing. The reason some people develop GERD is still unclear. However, research shows that in people with GERD, the LES relaxes while the rest of the esophagus is working. Anatomical abnormalities such as a hiatal hernia may also contribute to GERD. A hiatal hernia occurs when the upper part of the stomach and the LES move above the diaphragm, the muscle wall that separates the stomach from the chest. Normally, the diaphragm helps the LES keep acid from rising up into the esophagus. When a hiatal hernia is present, acid reflux can occur more easily. A hiatal hernia can occur in people of any age and is most often a common finding in otherwise healthy people over age 50. Most of the time, a hiatal hernia produces no symptoms. Distinguishing between normal, physiologic reflux and GERD in children is important. Most infants with GER are happy and healthy even if they frequently spit up or vomit. This is usually due to food sensitivities or allergies to mother’s breast milk or formula. Babies usually outgrow GER by their first birthday. Reflux that continues past 1 year of age may be GERD. Studies show GERD is common and may be overlooked in infants and children. For example, GERD can present as repeated regurgitation, nausea, heartburn, coughing, laryngitis, or respiratory problems like wheezing, asthma, or pneumonia. These are classic allergy symptoms associated with what they are eating. Infants and young children may demonstrate irritability or arching of the back, often during or immediately after feedings. Infants with GERD may refuse to feed and experience poor growth. Avoiding food 3 to 4 hours before bed may also help. Your healthcare provider may recommend raising the head of your child's bed with wood blocks secured under the bedposts. Just using extra pillows will not help. If these changes do not work, your medical doctor may prescribe medicine for your child. In rare cases, a child may need surgery. For information about GER in infants, children, and adolescents, see the Gastroesophageal Reflux in Infants and Gastroesophageal Reflux in Children and Adolescents fact sheets from the National Institute of Diabetes and Digestive and Kidney Diseases (NIDDK). See your healthcare provider if you have had symptoms of GERD and have been using antacids or other over-the-counter reflux medications for more than 2 weeks. Your healthcare provider may refer you to a gastroenterologist, a doctor who treats diseases of the stomach and intestines. Depending on the severity of your GERD, treatment may involve one or more of the following. Your medical health care provider may recommend over-the-counter antacids or medications that stop acid production or help the muscles that empty your stomach. You can buy many of these medications without a prescription. However, see your healthcare provider before starting or adding a medication. Antacids, such as Alka-Seltzer, Maalox, Mylanta, Rolaids, and Riopan, are usually the first drugs recommended to relieve heartburn and other mild GERD symptoms. Many brands on the market use different combinations of three basic salts— magnesium, calcium, and aluminum—with hydroxide or bicarbonate ions to neutralize the acid in your stomach. Antacids, however, can have side effects. Magnesium salt can lead to diarrhea, and aluminum salt may cause constipation. Aluminum and magnesium salts are often combined in a single product to balance these effects. Calcium carbonate antacids, such as Tums, Titralac, and Alka-2, can also be a supplemental source of calcium. Unfortunately, the calcium will not be absorbed or utilized by the body, since the antacid effect blocks the absorption of calcium. They can cause constipation as well. Foaming agents, such as Gaviscon, work by covering your stomach contents with foam to prevent reflux. This too will prevent proper absorption of nutrients and lead to other complications with your health. H2 blockers, such as cimetidine (Tagamet HB), famotidine (Pepcid AC), nizatidine (Axid AR), and ranitidine (Zantac 75), decrease acid production. They are available in prescription strength and over-the counter strength. These drugs provide short-term relief and are effective for about half of those who have GERD symptoms. They also cause decreased calcium absorption which may lead to osteoporosis and immune system weakness. Proton pump inhibitors include omeprazole (Prilosec, Zegerid), lansoprazole (Prevacid), pantoprazole (Protonix), rabeprazole (Aciphex), and esomeprazole (Nexium), which are available by prescription. Prilosec is also available in over-the-counter strength. Proton pump inhibitors are more effective than H2 blockers and can relieve symptoms and heal the esophageal lining in almost everyone who has GERD. There are side-effects to using these which should be considered fully before going on these medications. Prokinetics help strengthen the LES and make the stomach empty faster. This group includes bethanechol (Urecholine) and metoclopramide (Reglan). Metoclopramide also improves muscle action in the digestive tract. Prokinetics have frequent side effects that limit their usefulness — fatigue, sleepiness, depression, anxiety, and problems with physical movement. Because drugs work in different ways, combinations of medications may help control symptoms. People who get heartburn after eating may take both antacids and H2 blockers. The antacids work first to neutralize the acid in the stomach, and then the H2 blockers act on acid production. By the time the antacid stops working, the H2 blocker will have stopped acid production. Your medical health care provider is the best source of information about how to use medications for GERD. Many Pharmacists are a wealth of information too, especially when taking multiple medications. Most important to consider is when stopping acid production in your stomach, this stops your ability to absorb calcium which will lead to many other conditions such as osteoporosis and weakened immunity. Consider this before taking any medication for GERD. As with all medication, certain side-effects are known and others are not known. It is important to consider the side-effects and to do some research into the medication being prescribed to determine if the side-effects are worse than the symptoms associated with your GERD. Talking with your medical doctor or pharmacist is warranted. Considering Alternative treatments before starting stronger medication is best. Dr. Huntoon has quite extensive experience in addressing this condition by locating the underlying cause. In just about every case over 27 years of this condition, the person has a dysfunctional gallbladder secondary to having a parasite. When addressing this aspect of a person's health, along with resetting the gallbladder circuit, this condition always resolves once and for all. I have been visiting Dr. Huntoon for over a month in order to understand and conquer my stomach disease. Dr. Huntoon is an easy to talk to and understand person who will help you overcome any situation you are dealing with. If you are are ...More"I have been visiting Dr. Huntoon for over a month in order to understand and conquer my stomach disease. Dr. Huntoon is easy to talk to and an understanding person who will help you overcome any health situation you are dealing with. If you are struggling with any medical problem, Dr. Huntoon is sure to help if you are really willing to give it chance. He was able to help me, so he can most likely help you." Many Alternative Healthcare Practitioners such as a Holistic Chiropractor, Acupuncturist, Homeopath or Naturopath have had great success in treating GERD and other related conditions. Treatment of the most common cause of GERD, the Hiatal Hernia, takes 30 to 45 seconds and getting advice on how to prevent it from returning is ideal for this condition. Consulting with a Holistic Chiropractor who can help you develop a well-rounded approach to restoring balance to your digestive system is warranted. Eliminating the causes of GERD and other stomach upset is ideal. By working with a Holistic Chiropractor who can help you address the underlying cause of your GERD and removing the basis for the symptoms (hiatal hernia) will go a long way to fully resolving your GERD and its associated symptoms. Addressing the reasons for your digestive system imbalances is warranted. See your healthcare provider if you have had symptoms of GERD and have been using antacids or other over-the-counter reflux medications for more than 2 weeks. Your healthcare provider may refer you to a gastroenterologist, a doctor who treats diseases of the stomach and intestines. The Doctor also may Perform a Biopsy. Tiny tweezers, called forceps, are passed through the endoscope and allow the doctor to remove small pieces of tissue from your esophagus. The tissue is then viewed with a microscope to look for damage caused by acid reflux and to rule out other problems if infection or abnormal growths are not found. pH monitoring examination involves the doctor either inserting a small tube into the esophagus or clipping a tiny device to the esophagus that will stay there for 24 to 48 hours. While you go about your normal activities, the device measures when and how much acid comes up into your esophagus. This test can be useful if combined with a carefully completed diary— recording when, what, and amounts the person eats—which allows the doctor to see correlations between symptoms and reflux episodes. The procedure is sometimes helpful in detecting whether respiratory symptoms, including wheezing and coughing, are triggered by reflux. Frequent heartburn, also called acid indigestion, is the most common symptom of GERD in adults. Anyone experiencing heartburn twice a week or more may have GERD, and ultimately will have a parasite affecting their gallbladder. You can have GERD without having heartburn. Your symptoms could include a dry cough, asthma symptoms, or trouble swallowing. This is tell-tale for a Hiatal Hernia. If you have been using antacids for more than 2 weeks, it is time to see your healthcare provider. Developing a healthy life-style with proper guidance from your Holistic Chiropractor is the best prevention when considering how to approach your health. Most doctors can treat GERD. Your healthcare provider may refer you to a gastroenterologist, a doctor who treats diseases of the stomach and intestines. Most infants with GER are healthy even though they may frequently spit up or vomit. This is most likely due to food allergies related to breast milk or formula. Most infants outgrow GER by their first birthday. 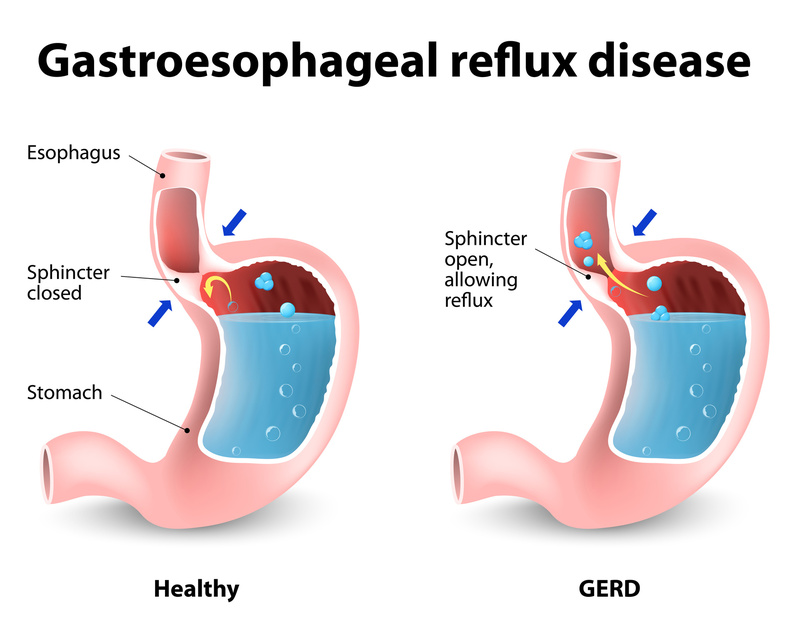 Reflux that continues past 1 year of age may be GERD. The Medical reasons certain people develop GERD and others do not remain unknown. Several factors may be involved, and research is under way to explore risk factors for developing GERD and the role of GERD in other conditions such as asthma and laryngitis.